The Dream Cemetery project stems from the ancient Japanese tradition of origami making. 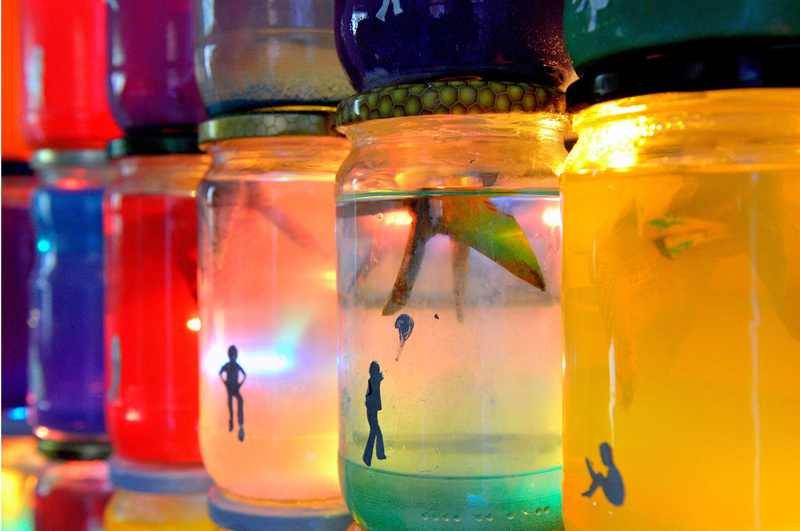 The artist enhanced it with a special research: she invited people to remember their childhood dreams, wrote them on newspaper paper origamis and sank them into jars of coloured water. Keiko Miyazaki thus explores the boundaries of intimacy of an individual while trying to redefine the concepts of secrets and taboos by awakening these old dreams. Dream Cemetery in this way functions in space as some kind of contemporary version of a cenotaph, a colourful monolith that turns dreams and memories into countless shades of colour. Keiko Miyazaki (1978, Ehime, Japan) concluded her graduate and postgraduate studies of visual arts at the University of Northumbria in England in 2003. After moving to Slovenia, she continued her studies at ALUO in Ljubljana in 2004 and in the Academy in Krakow in Poland (2005). With her work she explores different aspects of communication by connection and inclusion of/in the environment. She’s received the Sakaide Grand Prix in 1999, awards for TV-shows Cosmos Cable (2005) and the award of the Shikokuchuou city for the cultural contribution. She’s exhibited her works in Slovenia and abroad. She lives and works in Slovenia.